Trends in country fashion, from detailing and color to patterns and textures, combined with a cost-sensitive consumer and stiff competition from well-appointed discount shoe stores, outlets, and departmental stores, exert additional pressure on the Western Wear retailer. Equally critical to the success of the business is the ability to analyze and act on consumer buying patterns and source the right mix of style, size and color. 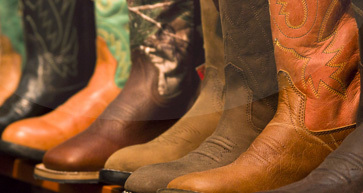 To strike this balance and remain profitable, Western Wear retailers need an integrated retail management solution that allows flexibility to cater to the diverse and unique demands of their customers and maintain proper inventory. A system that seamlessly integrates all business processes, from the POS at the store to the merchandise planners and buyers at the Head Office, will help lower the overall cost of operations, simplify expansion and enable today’s Western Wear retailer to maintain a unique selling proposition and position in the marketplace. A Western Wear Retailer needs to have a POS system that is designed to help improve business processes, become profitable and control costs related to implementing new systems in stores. Remain closer to the consumer and analyze buying patterns and sales trends.